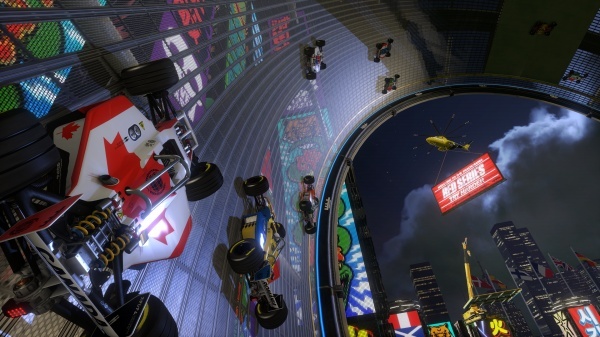 TrackMania Turbo is an arcade racer in the purest sense: exaggerated physics, breakneck speeds, insane jumps, and tracks that can only exist in a video game. The game serves up its tracks, about 200 in all, in bite-sized chunks, most of which can be run in under a minute. You'll never know what to expect from a track until you run it for the first time. It could feature monster jumps, corkscrew turns to test your drifting skills, or even loops or wall-runs, and is often a combination of all of those. It's all about the time it takes you to reach the finish line and you'll pay dearly for each mistake that you make. Luckily a single button press will restore you to the last checkpoint that you crossed while another will let you instantly restart the track. The checkpoints are relatively numerous taking into consideration the lengths of the tracks, but I found that I'd rather restart than rewind. There's a certain rhythm and flow you need to get into to do well on a track and a mistake takes you out of that, so you may as well start over at that point because it's tough to get your groove back when you come flying out of a checkpoint. Each track has par times to earn bronze, silver, and gold medals, and your cumulative total of medals at each of those levels are used to unlock additional - and more challenging - tracks for play. At first you'll be able to hit the bronze medals with some regularity and steadily progress through the track list. However, the mid-tier tracks will require a minimum number of silver medals to unlock, and gold for the tracks beyond those. This will send you back through the tracks that you've run before, working to perfect your techniques and the timing of your moves to improve your times in each track. The tracks are fun to race and I enjoyed the challenge of trying to push my track times lower - you can even turn on ghost cars that will run the track at each medal level to keep you on pace - but if you're the type of gamer who doesn't like that sort of thing than you will probably experience about a quarter to a third of the tracks the game has on offer. On the other hand, you won't have much luck with the more challenging tracks unless you hone your skills on the preceding tracks first. At this point you should have enough to go on to decide whether or not you'd enjoy TrackMania Turbo. It's an arcade stunt racer with a wild imagination that serves up a large variety of tracks in bite-sized pieces. 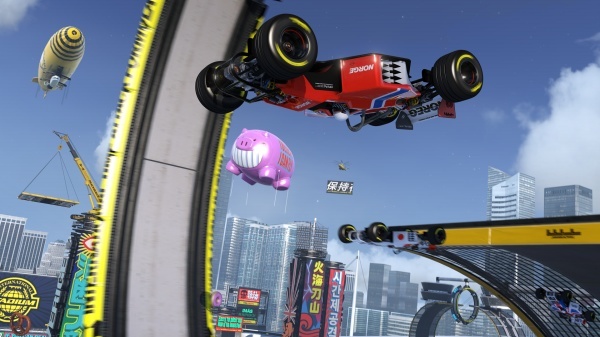 If that sounds like you're kind of thing, then you're going to love TrackMania Turbo and may as well stick around to see what else the game has on offer. If not, well, there's nothing else to the game that's going to change your mind, so you should look elsewhere to spend your gaming dollars. If there aren't enough tracks in the game for you, or if you simply want to try your hand at track design, a simple to use track editor is included with the game. It's pretty easy to build a track using the context-sensitive tools menu that only presents you with the track pieces that you can currently snap onto the end of your creation. It's so simple to use, in fact, that you can just tell the game to create a track for you and the editor will piece together a random track while you watch. You can enjoy these tracks on your own, or upload them to share with the world. Of course you can download tracks created by others, as well. Multiplayer modes include both local and online races. Locally, you can compete in split-screen mode or by taking turns. There's even a rather, um, unique mode in which two players control the same car with the game basically averaging the inputs from the controllers. It feels more like a party mode played for the occasional social laughs than a serious racing mode. Online multiplayer racing is crazy in its own way. The game can match up to 100 players on the same track and they basically all go at it at the same time. You're not racing directly against each other in the traditional sense - there's an overall clock and you can run, re-run, and reset as many times as you'd like within that time limit. After time's up, the players' best times are compared to determine the overall winner. It's a pretty wild affair - you're not just trying to navigate the track, you're also trying not to get distracted by all of the other cars flying all over the place. I had a blast with Trackmania Turbo. I loved the way that each track felt like a new challenge, and the way that they are delivered as bite-sized challenges. It's the sort of game I'll keep going back to for a while - it makes for a great warm-up to or intermission for every gaming session. Final Rating: 92% - Pure arcade racing that's pure fun.